Windows 8 screenshots below are from the new Windows 8 release that has been available on 29th of March, 2012 for public review. The latest Windows 8 release date was guessed true by the community. And this public available Windows 8 release is named as Windows Consumer Preview. Developers and IT professionals will remember, Microsoft named the previous Win8 release as Windows Developer Preview. So Microsoft just meet Windows 8 with developers and enabled them to get ready for providing software applications or professionals IT solutions. Now it was time to meet the new beta of Windows 8 with end user or consumers. Windows users who want to get familiar with what is new in Windows 8 can download Windows 8 beta (Consumer Preview) release. I have already downloaded and installed x86 (32bit) version of Windows 8 on my laptop PC. I completed Windows 8 installation on virtual machine (using VMware Player) and places Windows 8 screenshots here. Here is a list of Windows 8 screenshots from Windows 8 beta (Consumer Preview) release. Windows 8 screenshot during installation with Windows Consumer Preview release (29th February 2012). Windows 8 beta release is only available in limited number of languages. Windows 8 screenshot of user desktop right after the Win8 setup is completed. 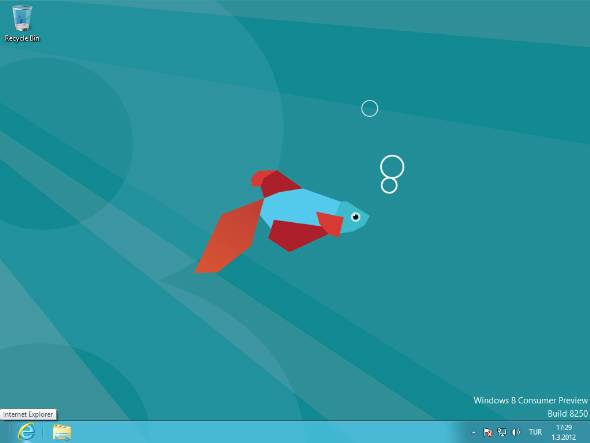 I like this new Windows 8 desktop fish. But I guess Win8 beta fish is only for Windows 8 Consumer Preview release Build 8250. A new desktop image will sure take its place on new Windows 8 desktop screen. 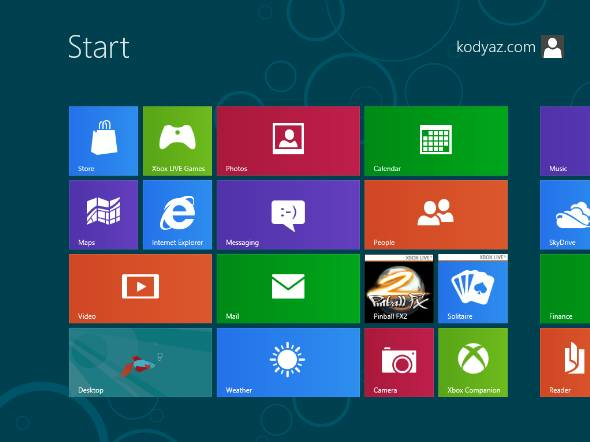 Windows 8 Start screen in Windows Consumer beta installation. The new Windows 8 start screen is different than the preview Windows 8 beta release. New application icons take place on the Start screen. Only a few games are displayed in the new Windows 8 beta build 8250. Internet Explorer beta version Windows Internet Explorer 10 Consumer Preview is shipped with new Windows 8 beta. Internet Explorer 10 has also the same build number 8250 with Windows 8 Consumer Preview beta version. You can fine many more Windows 8 screenshots in Windows 8 section.